Stop 5 on our mid-size city vacation tour is Grapevine, Texas. With a population near 50,000, this is the smallest city on the list, but it’s got so much to offer summer vacationers, I had to include it! Besides, if you need to see skyscrapers, Dallas is only a few miles away. Grapevine, Texas knows how to celebrate summer! Besides incredible local artisans, fabulous restaurants and Texas-size hospitality, Grapevine’s summer activities are designed for super-sized family fun. Here’s just a sampling of the fun Grapevine has lined up for you this year. The Friday Night Fireworks over Lake Grapevine light up the night sky every Friday at 9:30, kicking off the weekend with flair! (Pun most definitely intended!!!) This weekly show can be viewed on the rooftop of the parking garage at Gaylord Texan Resort, as well as parks around Lake Grapevine. You can download the show music at www.GrapevineTexasUSA.com/Summer. 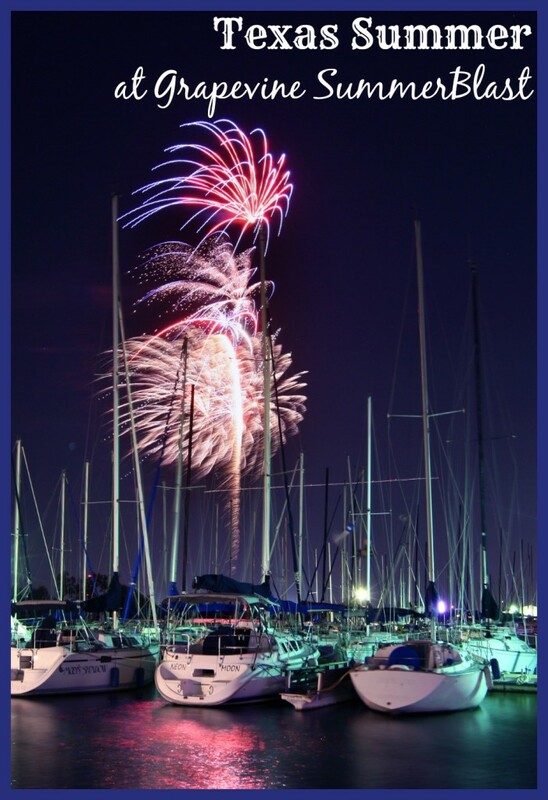 A special fireworks celebration is scheduled for the 4th of July. The 32nd Annual July 4th Fireworks Extravaganza is set to patriotic music to celebrate America’s birthday. The Human Plus: Real Lives + Real Engineering exhibit offers visitors to Grapevine’s Grand and Tower Galleries, 636 S. Main St., a chance to explore and create a range of low tech and high tech tools that extend human abilities. Human Plus was created by the New York Hall of Science in partnership with Oregon Museum of Science and Industry and the Quality of Life Technology Center with funding from the National Science Foundation. This exhibit runs from May 17 through September 14, 2014 and is free to the public. Hours are Mondays – Fridays, 8 a.m. – 6 p.m.; Saturdays 10 a.m. – 6:30 p.m. and Sundays, 12 p.m. – 5 p.m. The Evolving Universe is part of the Smithsonian traveling exhibit series featured at the Tower Gallery, 636 S. Main St., July 25 through September 30, 2014. The exhibition uses photos to take visitors on an Evolving Universe travel through time to learn about how the universe was created, how it has changed and how scientists study the far reaches of space. The exhibit was made possible by The Windland Smith Rice Nature’s Best Photography Fund. The exhibit is free to the public and is open Mondays – Fridays, 8 a.m. – 6 p.m.; Saturdays 10 a.m. – 6:30 p.m. and Sundays, 12 p.m. – 5 p.m. Step back in time on the Grapevine Vintage Railroad, located at 705 S. Main Street. Beginning May 31 through Labor Day weekend, Saturday and Sundays, little deputies can help capture notorious outlaws that stop the train. 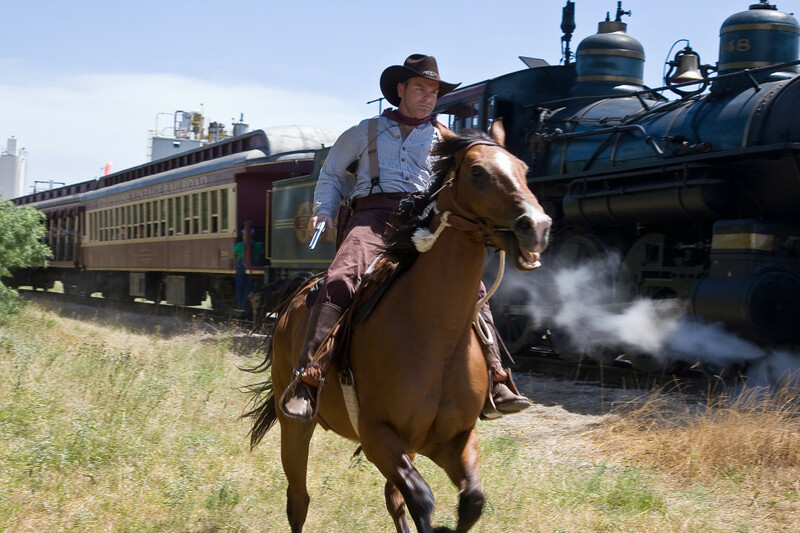 The round-trip train ride departs Grapevine for the Stockyards at 1 p.m. with an expected return of 5:45 p.m. Round trip tickets start at $10 for children and $18 for adults. Families looking for a bit less excitement can enjoy the Friday and Saturday Fun Trains, one hour rides that depart the Cotton Belt Depot at 10 a.m. and return at 11 a.m. Tickets are $8 for children and $10 for adults. Families and children of all ages will enjoy Le Theatre de Marionette’s “Hansel & Gretel,” playing July 29 through August 2 at the Palace Theatre, 300 S. Main St. Join Hansel, Gretel, and their pet goat, Willy, as they venture into the woods to find berries in this amusing take on the Grimm Brothers’ classic fairytale. 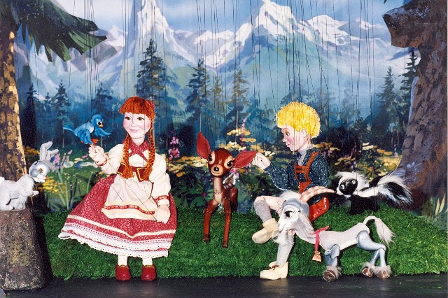 The classic story, told by puppets, includes encounters with Sandor the Sandman, a host of forest creatures, Guardian Angels and the kooky candy witch, Lady Rosina Sweettooth! Looking for a way to stay cool this summer? The Grapevine Opry Show’s “Dream Big Kids Summer Blast” show at the Palace Theatre, 300 S. Main St., features kids ages 5-18 performing 1950s pop tunes, including young Elvis impersonations, songs from popular children’s films including “Cars,” “Despicable Me” and “Frozen.” Shows are scheduled most Saturdays at 3 p.m. Adults haven’t been left out! The Grapevine Opry Show’s evening performances, featuring country favorites to popular hits, comedy and gospel, which family members of all ages will love. These performances take place most Saturday nights. In Texas, experience cowboy life — or at least a trail ride — at Grapevine’s Austin Ranch, 2009 Anderson Gibson Rd.! This genuine, Texas ranch lets families discover what “hee-haw” really means. Enjoy a shady, cool trail ride, as well as roping and relaxing on this 90+ wooded acre ranch surrounding a peaceful, 10-acre private lake. Open Tuesday through Sunday. Experience 19th century Texas at Grapevine’s Historic Nash Farm, 626 Ball St. Nash Farm hosts First Fridays at the Farm, featuring monthly special events to highlight different aspects of farm life. This year’s events feature crops (June 6), Keeping Cool (July 3), and Cotton (August 1). All First Fridays at the Farm events are 10 a.m. – 12 p.m. A $3 participation fee is required. On June 14, Nash Farm also hosts Dairy Day. Celebrating National Dairy Month, guests learn where milk comes from, get to milk a goat, make hand cranked ice cream and churn butter. Wagon Rides are also available for $1 per person. Admission for Dairy Day is free. 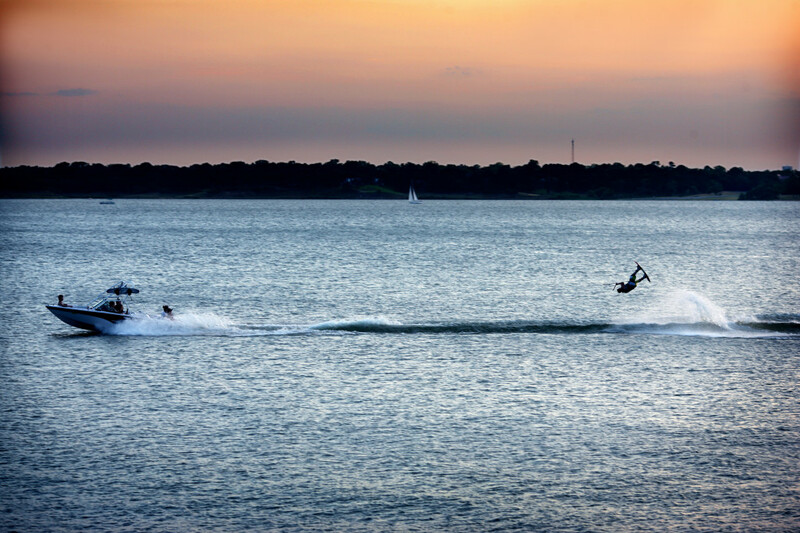 Outdoor enthusiasts will enjoy a variety of activities at the 8,000 acre Lake Grapevine! Take a chartered boat cruise or tour. Rent jet skis, pontoon boats and kayaks at Silver Lake Marina, 2500 Fairway Dr. Paddleboats and kayaks are also available for rent at Meadowmere Park. Get your Texas fishing license at Bass Pro Shops and enjoy fabulous fishing on the water. Lake Grapevine has everything you need for a great water adventure! For those who prefer dry land, Lake Grapevine offers more than 22 miles of paved and natural trails. Bicycles and other equipment can be rented at Grapevine Bike Center, 1106 W. Northwest Hwy., and Mad Duck Cyclery, 721 E. Northwest Hwy. Looking for something different? Explore the trails around Lake Grapevine on a Segway PT x2, rented from Grapevine Segway. Contact Grapevine Segway at 817-631-3273. Grapevine, Texas is home to 20 different hotels, each offering something different for your Grapevine getaway. Many of these hotels offer summer getaway packages, making your vacation more affordable — and more fun! To find the right hotel for your stay, check out these special summer offers. • Gaylord Texan Resort’s Paradise Springs. Beyond the decor, onsite restaurants and luxurious amenities, the watermark here offers a 10-acre resort pool and lazy river. Super summer entertainment includes live music, family entertainment, culinary events, and pool parties. • Great Wolf Lodge. The Great Wolf Lodge in Grapevine offers an 80,000 square foot watermark, with slides, rides and a lazy river. This resort also offers MagiQuest, Scoops ice cream shop, a kid-friendly spa, and dining options. The waterpark is available only to resort guests (arrive early and stay late — the changing rooms are great). Read our family review of Great Wolf Lodge Charlotte to learn more about the pluses and (very few) minuses. For more information on the Grapevine Summer Blast, visit the Grapevine CVB online. You can learn more using social media #GVSummerBlast on twitter and Facebook. For more information on restaurants and other activities in Grapevine, read this article. (sent once weekly) and we’ll send it right to your inbox. No spam! AND I will never sell or share your information! Sent monthly. No spam! I promise! Wow Karen! Leave it to you to find all these awesome places! I am not a big Texas fan due to the weather but I do like the nice places to visit! This is great! Thank you for sharing! I would love to visit Texas with both of my kids. This looks like a family friendly place! One of my friends just moved there — and I’m a bit jealous! I live in a great place, too, but Grapevine’s a great town. I am sure your kids would love it! So much to see and do. I would love to go there some day. Thanks for sharing. I hope you make it to Grapevine one day soon. Those look like some really awesome places to visit. It is! Summer or winter! Sounds like there are a ton of fun things to do there! I especially like the fireworks and the colors in that photo are amazing! Friday Night Fireworks are my favorite, too. They bring back childhood memories of July 4th celebrations. I hope you make it to Grapevine for SummerBlast! They’ve got even more planned. I just picked my top ten! See the Grapevine CVB site (link in post) for dates, times and more information. If I lived closer, I’d certainly be there especially for the Friday night fireworks. This looks like a really fun place to vacation. I never heard about Grapevine until reading your post but I am definitely adding it to my Texas wishlist. Thanks Karen. You’re welcome. I hope you make it to Texas soon.